Electronic Arts (EA) on Tuesday announced the release of Harry Potter and the Half-Blood Prince, a video game based on the upcoming movie. It debuts simultaneously on multiple platforms including the Mac. It costs $30. 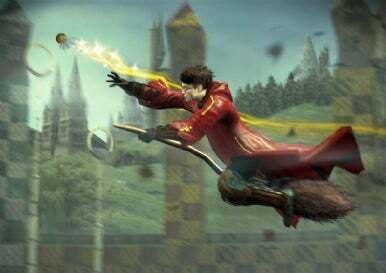 You can play Quidditch, engage in wizard duels and more in this game. Following the events in the sixth book of J.K. Rowling's Harry Potter saga, Harry Potter and the Half-Blood Prince returns players to Hogwarts, where Harry and friends are engaged in their sixth year studies. Players will be able to cast spells and play Quidditch on the Gryffindor team, put potion-making skills to the test, get sidetracked by Ron Weasley's romantic entanglements and discover the identity of the Half-Blood Prince. Players can join the Gryffindor Dueling Club, explore magical places like the Horcrux Cave and The Burrow, and more. The game is rated E 10+ for Everyone age 10 and older by the ESRB. The Mac and Windows versions have been released on the same DVD. You can buy it directly from EA's Web site or at various retailers. System requirements call for Mac OS X 10.5.5 or later, 1.8GHz Intel (Intel only, PowerPC not supported), 256MB RAM, 8x DVD-ROM or faster, 5GB hard disk space, ATI X1600 or Intel X3100 or better 3D graphics.